Every Saturday home game during the 2018 season is a Purple Heart Saturday where local Purple Heart recipients are honored on the field! Plus, Stone Crabs players wear special purple jerseys that will be auctioned off online during the season at stonecrabs.milbauctions.com/gallery.cfm. On Opening Night, the Stone Crabs brought twenty Purple Heart recipients to the field during the middle of the 7th inning for recognition. 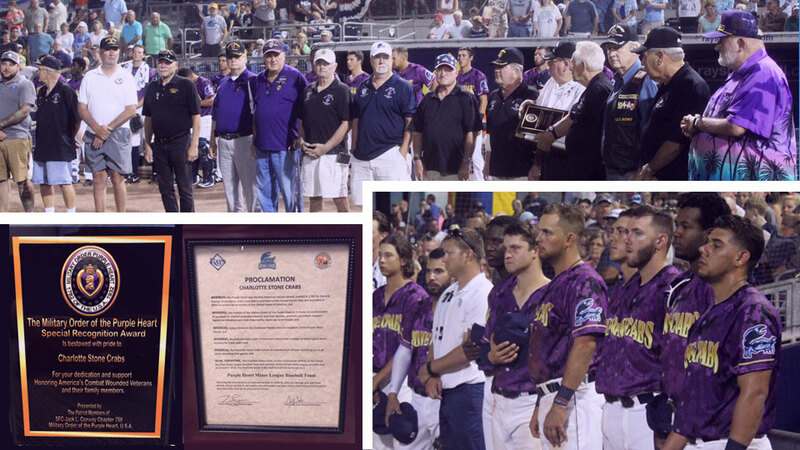 As part of the celebration the Military Order of the Purple Heart, U.S.A Chapter 759 honored the Stone Crabs with a special recognition award and made a Proclamation declaring the Stone Crabs as an official Purple Heart Minor League Baseball Team. To purchase tickets for a Purple Heart Saturday or any other game this season, fans can go online or call 941-206-HITS. Fans can also purchase tickets in person at the FCB Box Office Monday-Friday 10 a.m.-4 p.m.